Indeed, the latter went on to define the project – as any A1 owner knows, it runs hot. Being a full Class A design, with a constant power consumption of 80W, it was always going to; there’s a lot of heat to dissipate in a fairly small space. Tim says that he had chosen 20W RMS per channel as a, “manageable product in a reasonable size to run below 65 degrees centigrade”. Sinking all this heat was left to Pentagram, the industrial design company that Antony chose. “He paid them a fortune but got a very interesting visual impact to the basic design”, added Tim. The Musical Fidelity A1 was biased in full Class A at the suggestion of Tim de Paravicini. It used self-biasing and complimentary output devices in symmetrical, push pull configuration from the front end to loudspeaker terminals. The biasing was arranged to make sure the output could only operate at constant power consumption. The line and phono amp circuitry were discrete op-amp designs. Low cost 2N3055 and 2N2955 transistors were used “to prove a point”, says Paravicini, who remains proud of this “quite simple and unusual” circuit. The innards are a tight fit in that distinctive case. A generous 160VA toroidal transformer takes up some space, and provides the juice for four 10,000uF reservoir capacitors. An ALPS volume potentiometer is used, and along with a source selector, power switch, tape monitor button and rear panel-mounted MM/MC selector, there’s nothing else to mention. What you wonder when you look inside, is why the original version of the amplifier’s casing wasn’t vented. It occludes any real airflow, leaving the excellent heatsinking running on the ragged edge, slowly baking the components inside! The whole point about the A1 was that it was budget esoterica – which is to say that Tim de Paravicini set out to design something that sounded special but didn’t require exotic and expensive components so to do. The wee Musical Fidelity was initially designed to hit the price-point of £200, and achieve this by clever yet simple thinking that was distinctly different from something you’d see in a transistor textbook. The striking aluminium casework added a sense of visual exoticism to the already-special insides. Beautiful then as it is now, although distinctively a nineteen eighties amplifier, it looks far less dated than almost all its contemporaries. 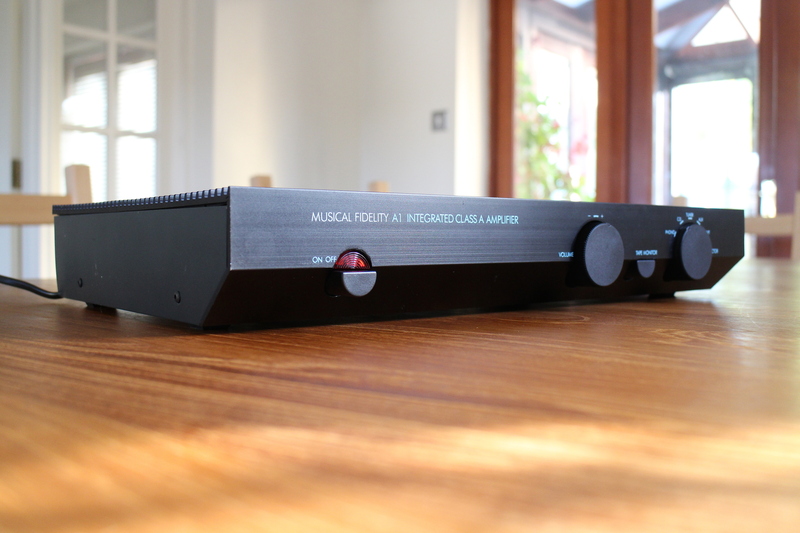 This is in my view the best sounding mid-price integrated amplifier of its time. Having heard and/or owned all its contemporaries, for this writer it offers a degree of magic that you simply don’t get from the likes of the Naim NAIT, Exposure X, Myst TMA3, Inca Tech Claymore or Onix OA21 – excellent as these all are in their own special ways. For a £200 amplifier in 1984, it is a startling achievement; even against a modern, top-class mid-price integrated such as the Exposure 3010S2 (£1,500) it shows its audacious quality. This isn’t to say the A1 is beyond criticism, because it is not. It’s a hard amplifier to use, and certainly difficult to really get right, whereas most of its rivals are far less fussy. You keep coming back to two things – heat and power, too much of one and too little of the other. The amp needs efficient speakers – of around 90dB or more at least. Anything lower and you begin to hear the sound of it wheezing and groaning under the strain of moving the wretched box’s drive units, something the isn’t a core competency of the A1. Properly matched and positioned in a well ventilated area with nothing on top except cool air (anything else is likely to melt), you get a sublimely sweet sound. It’s not the Sugden sort of Class A, which is very bright and searching tonally, it’s more – dare I say it – like a really good valve amplifier. Really bad valve amplifiers are syrupy and gloopy, heavily coloured and opaque, whereas the A1 isn’t like this at all. It’s sophisticated, slick and sparkling tonally, but doesn’t cloud the music or reduce it all to one particular sort of romantic sound. You’re always aware of a slight, subtle sepia tint but it is never invasive and adds rather than detracts from the proceedings. Still, the A1 isn’t all about being a nice, inoffensive product. There are plenty of those and a great many are terminally boring – the opposite of the little Musical Fidelity. Instead, this is wonderfully fast and fleet of foot, amazingly expressive and lucid. It has all the charm and lyricism of beautifully spoken Italian, in a world where so many amps sound like accountants conversing in German. It really does have a kind of ‘magic dust’ of its very own; whatever music you play suddenly seems to have an emotional point to be driven home, rather than an assemblage of sounds to be picked apart. If music is the food of love, then the A1 is an aphrodisiac! It’s brilliant on microdynamics, but doesn’t do quite as well in all out thunderous crescendos. Bass is warm and sumptuous but doesn’t have the breathtaking attack transients of a really good solid-state Class AB design. Imaging is good but again isn’t exceptional. Instead however, the listener’s attention is draw back – time and time again – to the emotion embedded in that complex collection of musical notes. It is exceptionally good in this respect, and merely ‘solid’ in many others – its frequency extremes are vague, but everywhere else is this most alluring and enchanting sweet spot. Living with a Musical Fidelity A1 today is perfectly possible, but first you’ll have to make sure it is working correctly and to spec. Of all thirty year old British amplifiers, this is the one that is most likely to need a service. Musical Fidelity no longer does this but there are some specialists willing to help such as Amp Repair Services. The main problem is that the amp is effectively a slow cooker for all the electronics inside; the electrolytic capacitors are the first to suffer so should all be replaced if they haven’t been already. Heat issues have given the amplifier a bad reputation for reliability, and here Tim de Paravicini says that cost-cutting played a part. “I had laid out thermal requirements but reliability of the circuit was very good, The product was let down by trying to save costs and some cheap parts caused some problems”, he confessed. The next step is of course to ensure that you’re running it with a good, efficient pair of loudspeakers; paradoxically this is easier done now than it was when the A1 first came out. The problem was that back in the nineteen eighties, efficient loudspeakers were about as fashionable as a mid-seventies supergroup. By this time, most audiophiles aspired to big, butch (Class AB) transistor amps, and tiny power sapping mini-monitors (Acoustic Energy AE-1s et al.) The A1 was not of that ilk, and found itself being marginalised by many reviewers as too niche. Ironically they were probably correct back then, but subsequently the world has moved towards the A1, not away. Was the Synthesis not the 1st MF integrated? The MF A1 was my first serious purchase in 87, along with MA 352 speakers. A couple of years later had Oracle Delphi III / RB300 / AT ART1 front end. This seemingly odd combination was the loveliest sounding hi-fi I have ever owned. Unfortunately MF A1 reliability was a disaster, mine needing several new volume pots. before failing terminally at about 5 years. Just heard that Pro-Ject has bought MF from AM and plan to re-introduce the MF A1. Really hope this will be with the original TdP Class A circuit, but expect the later AB design. If the former I shall buy one. Great review. I bought my A1 new in 1990 and never considered changing it. Wonderful sound I never tired of. It was serviced every four years and after 18 yrs it inevitably cooked itself to smoking silence. I had it ‘repaired/recapped’ by those noted. It didn’t last long 10wks before it died again! The only person capable of truly rebuilding this amp is the ex MF Service Manager, John Sampson. It is not a cheap job but John implements all the upgrades that were carried out by MF up to the end of it’s production life. It’s an amazing and worthwhile improvement on the performance I never thought possible. Fantastic sounding amplifier. It’s certainly exotica in today’s world. John.